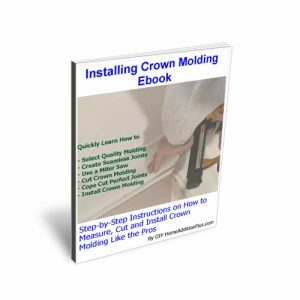 In this video I show how to reinstall old baseboard trim onto the walls of my master bedroom after having new wood flooring installed. 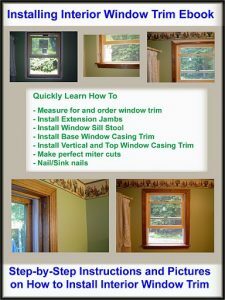 If you carefully remove old baseboard trim you can reuse it, saving yourself in the process lots of time and money. In this video, I explain and show how to properly reinstall the baseboard trim in my master bedroom such that it looks as good as new. The first step in reinstalling baseboard trim is to use masking tape to mark the locations of the wall studs. Make sure to place the tape high enough up on the wall so that the tape is not covered by the old baseboard trim piece when it is placed up against the wall. Next, use a small block of wood and a hammer to tap the piece of old baseboard trim up flush against the wall. Then, preferably, use a finish nail gun to nail the baseboard trim to the wall. In this video I am using a 16 gauge finish nail gun with 2-1/2 inch finish nails for the 1×6 portion of the baseboard trim. I am also placing the nails relatively in the same location as the original nails. This helps to reduce the amount of nail dimples in the finished baseboard trim. For the top accent trim pieces I am using 1-1/2 inch finish nails. I am fastening the top accent trim piece to the 1×6 baseboard piece and the wall stud. Note that on the accent piece I am firing the nails into it at a 45 degree angle. After nailing all of the old baseboard trim pieces to the walls, I then caulk all of the nail holes and seams. I also caulk the top seam, along the wall and top edge of the accent trim piece. Lastly, I went back and quickly repainted over the old baseboard trim to cover the caulk.